On Thursday, workers in the energy sector in Greece went on strike against the government’s plans to privatize the sector in the country. The workers also marched to the Greek parliament, where a new law regarding the sector has been tabled. The call for strike was given by the workers’ union of SEFA-DEPA. Several unions, including DEFA Employees Union, DESFA Labor Force Association, Energy Trade Union and the Union of Employees at IGME, took part in the march. The Public Gas Corporation of Greece (DEPA), together with its subsidiaries, has been instrumental in the transmission, distribution and sale of natural gas in Greece. The new bill calls for a merger of the subsidiaries, a new split of DEPA into DEPA Trading and DEPA Infrastructure, and overseeing the sale of 50.1% of DEPA Trading and up to 14% of DEPA Infrastructures. The draft law also provides for the replacement of the Institute of Geology and Mineral Exploration(IGME). The bill was passed in the parliament on Thursday, backed by the the ruling coalition, led by Syriza (the Coalition of the Radical Left). The opposition, led by New Democracy (ND) and the Democratic Compatriation, voted against the bill and tabled their own model for privatization. The Communist Party of Greece (KKE) also voted against the bill. KKE member of parliament, Diamanto Manolakou, claimed that the bill was intended to speed up the commercialization and liberalization of the sector, for the benefit of large business groups. 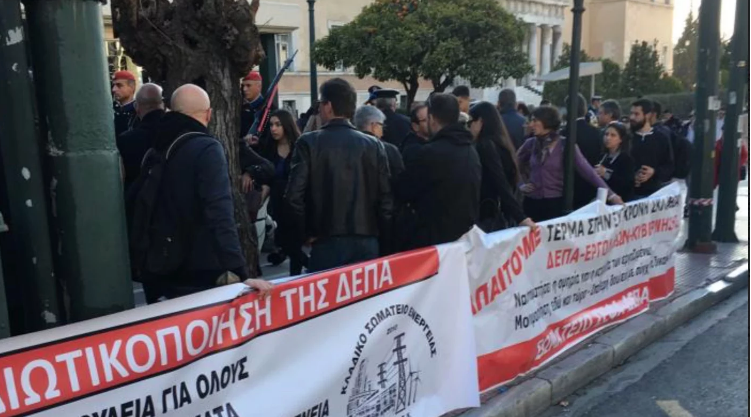 In their statement, the SEFA-DEPA workers’ union said that “the SYRIZA government is pushing for the policy of liberalizing the energy market, which leads to the striking of labor relations, while at the same time increasing prices for households, thus transforming Energy from a social commodity into an expensive commodity”. “Another step in this direction is the Bill tabled on Thursday, which provides for a new separation of DEPA to facilitate its further sale. It has been announced by the RIS that it will initially sell 50.1% of DEPA Trading and then 14% of DEPA Infrastructure, companies to be set up under the bill in question. Let us remind you that the government privatized DESFA (National Transmission System) while it has in its immediate plans the privatization of the Hellenic Petroleum,” the union added. According to reports on that the workers in the energy sector also went on strike against privatization on February 29, and marched to the Ministry of Energy on February 19, demanding permanent jobs.